These stuffed brinjals are soft and gooey with an aromatic stuffing that include fresh coconut, fresh coriander and cumin. The kitchen is filled with an incredible aroma as the baby brinjals roast over slow fire. I’ve always been a fresh coriander lover and its inclusion elevates this hearty Andhra stuffed brinjal recipe. In fact fresh coconut and coriander are the flavor boosters for this vegetarian dish. The key is in choosing the right kind of brinjals. Avoid the seedy bitter variety and go for tender, baby brinjals. 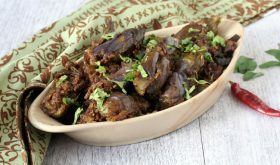 Though the dish lacks in looks, it more than makes up in flavor 🙂 All brinjal lovers, especially the ones who heart stuffed brinjals, will surely make this a staple. Prepare stuffing by grinding all the ingredients called for 'stuffing' by adding a tbsp of water. Stuff the brinjals with the stuffing and keep aside. Heat oil in a cooking vessel, add curry leaves and asafoetida and saute for a few seconds. Place the stuffed brinjals in the oil and cook on medium high flame for 2-3 mts. Cover with lid and let them cook on medium low flame for 12-14 mts. Keep checking in between and stir fry to ensure they donâ€™t burn or stick to the pan. Add the tamarind extract along with the water. Add any left over stuffing at this stage. Bring to a boil and reduce flame, place lid and cook for 10-12 mts. The water content should reduce. Serve with rice, pappu pulusu or sambar. Tamarind is optional. If not using tamarind, add water and follow rest of the recipe. Vegans can omit ghee in the stuffing and follow rest of the recipe. 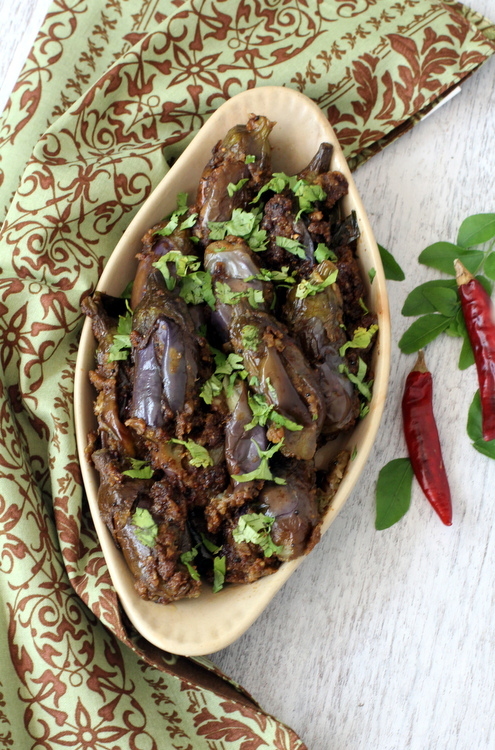 By Sailu Published: July 3, 2013 A classic Andhra style stuffed brinjal recipe, Vankaya Kobbari Karam. Tender purple brinjals, fresh coconut, fresh coriander and spices go into its making. Can’t wait until my CSA box comes with the baby eggplants. This will be heavenly! When do you add the jaggery? I love your recipes. But hAve a question. I stay in this really small town where we are the only indian family. I don’t get coconut in stores and so I keep powdered coconut at home for some gujrati recipes.. Yours are asking for fresh. Now what do I do? Go ahead and use dried coconut powder. For stuffing, is it coriander seeds or leaves? I’m new to cooking so this might be a really stupid question. When do the red fried chilies go? Can’t find them in the recipes.